Well, first, do not make it difficult, just let it be non-standard. Many install a router and use the proposed password. Here everything is simple, we turn the router and the bottom of the login and password of our network, which were installed from the very beginning. If you for some reason became impossible to read, you can learn the standard passwords and logins of the routers in the internet. Find the password in the Windows network settings If we have already used WIFI from this computer, it has memorized the network parameters so that you do not enter your login and password each time. 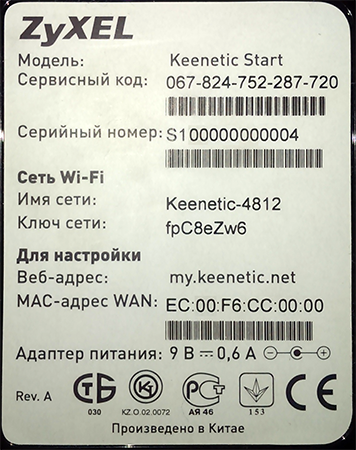 We go to the "Network and Sharing Center"
we find the password in the "Network Security Key" field, without forgetting to tick the "Show input characters". If the other, then he should know, the one who set up the network. There we find the password for our network, which we can and change to more memorable. The router has a small hole signed by Reset, you can press and hold the stylus or staple and letting go of the router for 30 sec., And then releasing our Reset and turn it on after 30 seconds . The settings will return to the factory settings. It is true that the network will have to be re-configured. So if you do not know how to do this, prepare to call a specialist. Description is given in general, the main direction. Everyone has different OS and router.